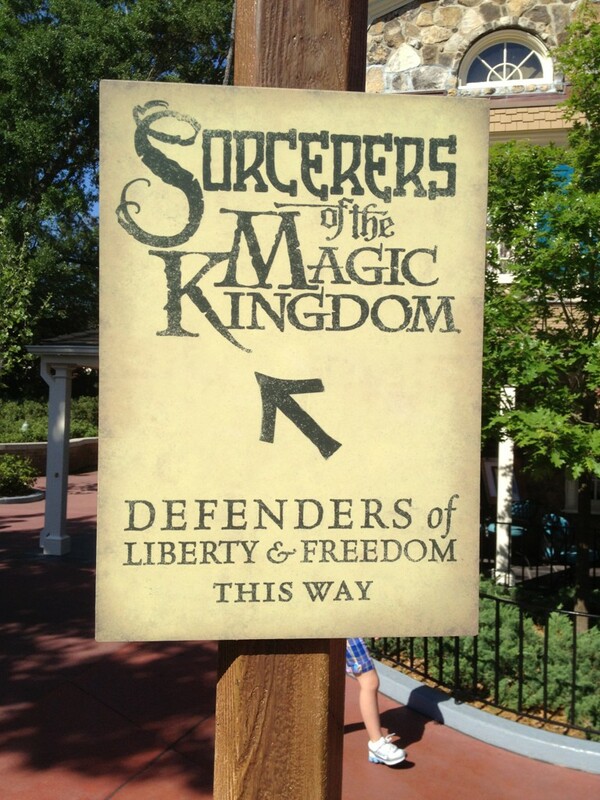 disney | Sorcerers Of The Magic Kingdom: The Blog! 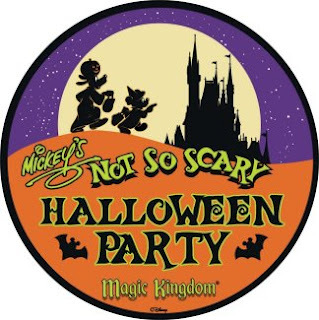 It was announced on the Disney Parks Blog this morning, Minnie Mouse is featured on this year’s MNSSHP card. This marks the 7th Special Edition Card as it is listed as 07/P. Kind of disappointing they went with a Fab 5 Character, but hey at least it’s not Olaf. What do you think of the card? So it’s official for the 2nd year in a row an exclusive SotMK Spell Card will be offered at MVMCP. 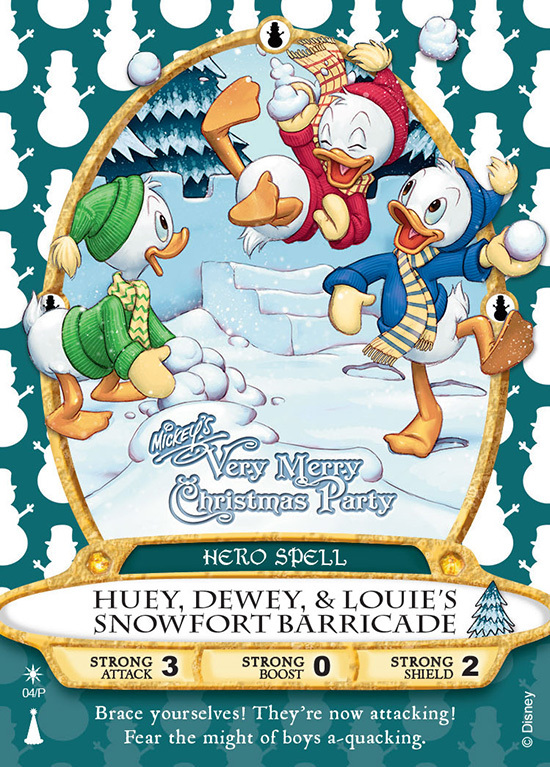 This card is an absolute win for me personally being a huge Ducktales fan. I have to say I am very pleased with the cards that were created for this years events. Well done Disney! For all the details check out the Disney Parks Blog here! 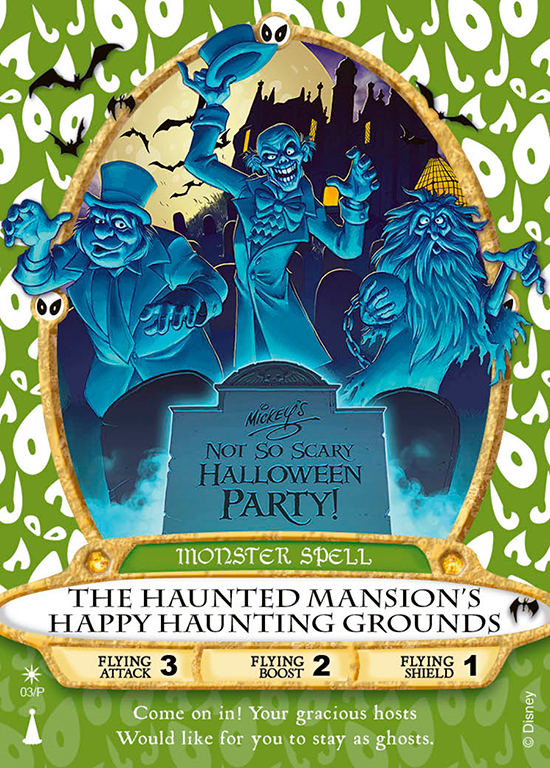 As we first reported last Friday, the Disney Parks Blog did indeed confirm this years exclusive MNSSHP SotMK Spell Card to be themed to The Haunted Mansion! Being a huge fan of The Haunted Mansion I have to say this card looks great, very well done! Today friend of the blog Jeff Reisdorf was able to quickly test the card before a slight system crash, here’s what he had to say. While I am sure this card levels up like the rest, it seems that we’re off to a great start! Be sure to tweet us any photos or videos once the card goes live @sotmkblog on Twitter! 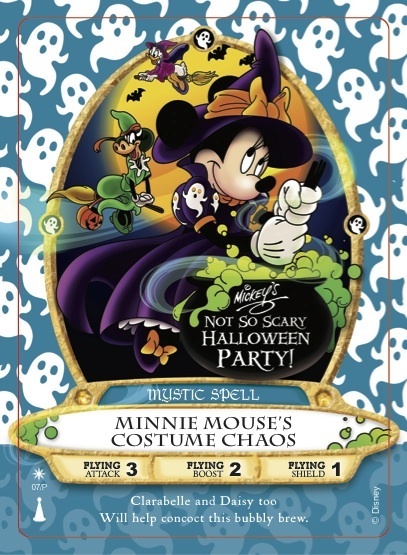 With Mickey’s Not So Scary Halloween Party just under two weeks away, SotMK fans are hoping that an exclusive spell card will materialize… I am very excited to say that it will indeed! 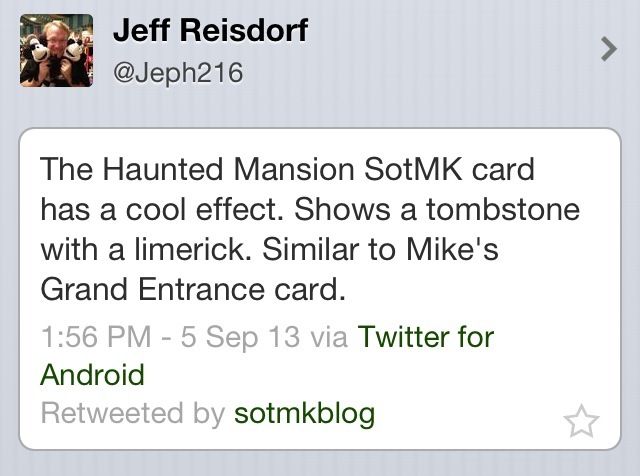 From what I’ve been hearing this years MNSSHP spell card will feature THE HAUNTED MANSION! While I am not sure which characters will appear, I would expect the Hitchhiking Ghosts or either The Hat Box Ghost. Also the card should read 03/P & feature the sun symbol just as the cards from the previous parties. Expect the card to be distributed in the same fashion as last year, wristband and ticket required no exceptions. 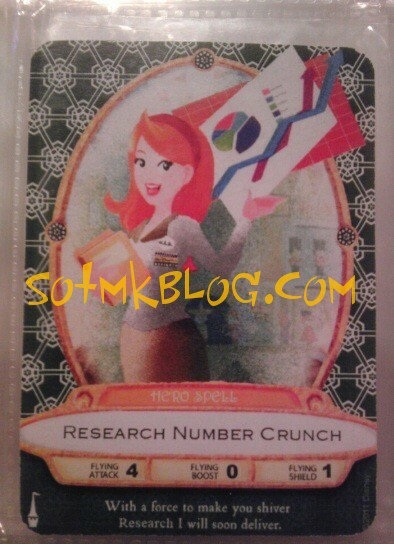 I am really looking forward to this card, heck maybe even the SotMK haters will be after this one. In just a couple of days marks the 1 year anniversary of SotMKblog.com! I can’t be happier with how far we’ve come in such a short amount of time. To celebrate we’ll be doing a series of giveaways throughout the week. Unopened packs, pins, booster packs and a few other surprises not just limited to SotMK merchandise! I know what some of you are thinking, I don’t use Twitter! All of your giveaways are on Twitter! Well don’t fret, I’ll be expanding the giveaway to the Facebook fan page as well! However my advice to you is to follow us both on Twitter & like us on Facebook to double your chances! Today at 5PM EST I will post info about the first giveaway to both Twitter & the Facebook page. Good luck to all and thanks for the support! This may be the rarest of all! 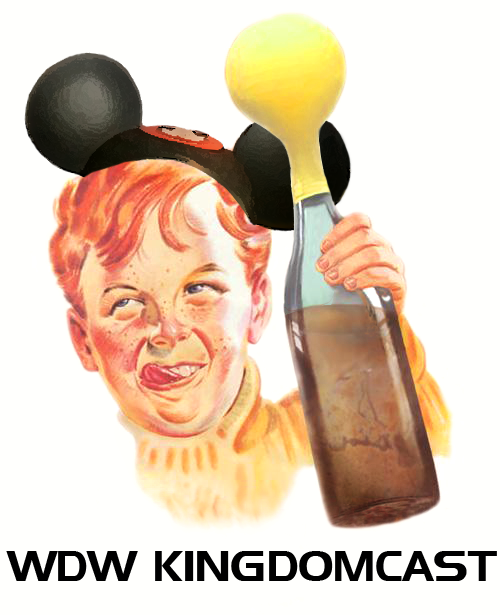 Shortly after SotMK made its debut there was about a one month period in which WDW Research Cast Members were conducting surveys about the attraction. According to the anonymous message I received which contained this image, that person informed me that this card was given to them as a Thank You for their hard work in gathering the mass amounts of guest feedback. Just like the original over sized Cast Member Card this is not effective in the game itself and is simply a memento for cast members only. I don’t think anyone will be adding this one to their collection anytime soon! With the SotMK community continuing to grow both online and in the park, there are many people who missed out on the limited edition spell cards released at MNSSHP & MVMCP. Which leads me to ask, what are these cards worth? Better yet, what is a fair trade? My initial opinion was that the special event cards would hold a high value and be a nice collectible in the future. However I just don’t think that’s going to be the case. The general consensus seems to be that people are just looking to get back the value of their party ticket. It appears even that has become fairly difficult. When it comes to the sale of the special event cards on the resale market you’ll see all kinds of numbers. Early on the average asking price was roughly the cost of admission to whichever party was attended. To my surprise that number has dropped dramatically. After doing a few sold item searches on eBay you’re looking at a fairly broad price range of $20-$50 for either the MNSSHP or MVMCP card. There are two reasons as to why I think they haven’t held any value. The first being is that the market is saturated with them. People spend a lot of money on vacation and are likely looking to get some back and selling their extras is the first move. Not to mention the words Limited Edition typically mean $$$ to most people and see that as an attempt to profit. Second being that In 2012 there were only 23 dates in which you could obtain Chip N’ Dale’s Bag of Tricks and 20 dates for Wayne & Lanny’s Ornament Barrage. Although the total quantity of each card given out is unknown I was told by several sources that there was an allotment of 2500 per party. Now in reality that doesn’t seem like much given the amount of attendees each night. However I hadn’t heard of them running out once. Which brings me to this point, we truly have no idea how many of these cards were distributed. Had they completely ran out of cards on every party night there would have been 57,500 MNSSHP & 50,000 MVMCP cards distributed. Considering that was probably not the case, let’s just say there are 20,000 of each card in circulation. That definitely doesn’t bode well for anyone looking to profit let alone break even. So considering the fact you’re not going to retire off the sale of these cards even though there are plenty of people who want them. What’s a fair trade? 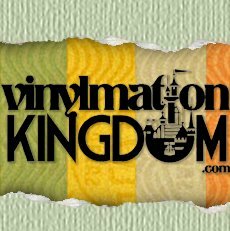 You have to figure everyone has different opinions and it will vary from time to time based on an individual need and a persons proximity or ability to visit WDW on a regular basis. With that in mind I strongly believe those circumstances should be taken into consideration. For example, Mr. A has a MNSSHP card and won’t be taking another trip to WDW for 3 years. Mr. B is an AP who visits multiple times of year but missed out on MNSSHP. However he has the ability to obtain lightning bolt cards regularly. Is it too much for Mr. A to say they want 4 lightning bolt cards for their special event card? Personally I don’t think it is, 4 Booster Packs at $13.95 with a 10% AP Discount is just over $50. Not too far off the price of that Mr. A paid for his party ticket. Now I do realize that is a bit higher than you can likely snag one for on eBay. However the point I am trying to make is that it’s not that unrealistic given that it always comes around to people just trying to break even. Whichever route you decide to take in getting one of the exclusive event spell cards just remember it isn’t as difficult as you might think.